After wearing a Najah-made garment each day for the last 7 days (a fun personal experiment), I realized that I could probably pull off the Me-Made 2012 challenge going on this month. Since I have only sewn 14 garments so far this year (one of which is a kimono robe meant for lounging about the house with a cuppa tea or a giant glass of wine), my May will be MOSTLY me-made. This challenge will put me face to face with my as-is wardrobe, forcing to me to creatively assemble outfits that feature made-by-mes coordinated with RTW pieces already in my closet. 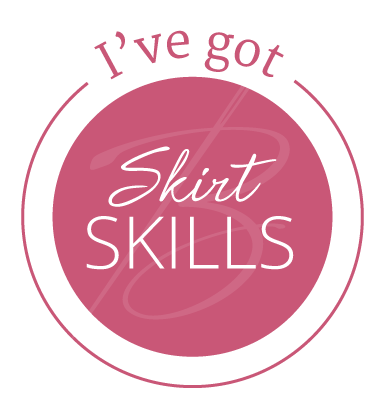 I, Najah of Wanna Be Sewing Something sign up as a participant of Me-Made-May ’12. I endeavour to wear at least one handmade item most days for the duration of May 2012. So, jumping into this thing…here’s what I’m wearing today. 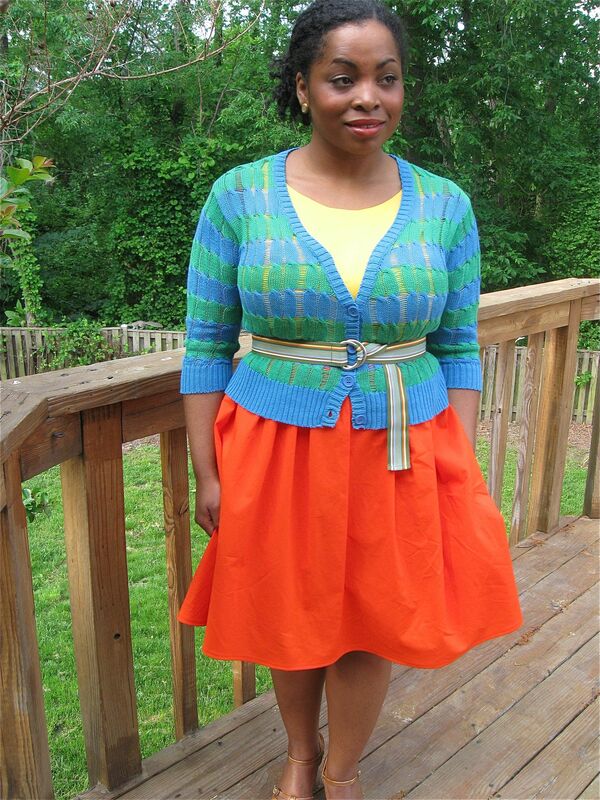 The Look on the Bright Side dress plus cardigan and grosgrain belt. This will be a crazy-bizzy month for me (Mom coming to town in a couple weeks, work project deadlines dropping, etc. ), so I’m hoping to leverage the zen I’ve built up during Operation Sew Balanced and take myself a bit less seriously…at least until May 31st, the date I am scheduled to collapse ;-). Look out for more What I Wore photos this month. In the meantime, this outfit’s gotta head to the office. I’ll be back later with some show n’ tell from last week’s dress made for the Tickled in Pink challenge. 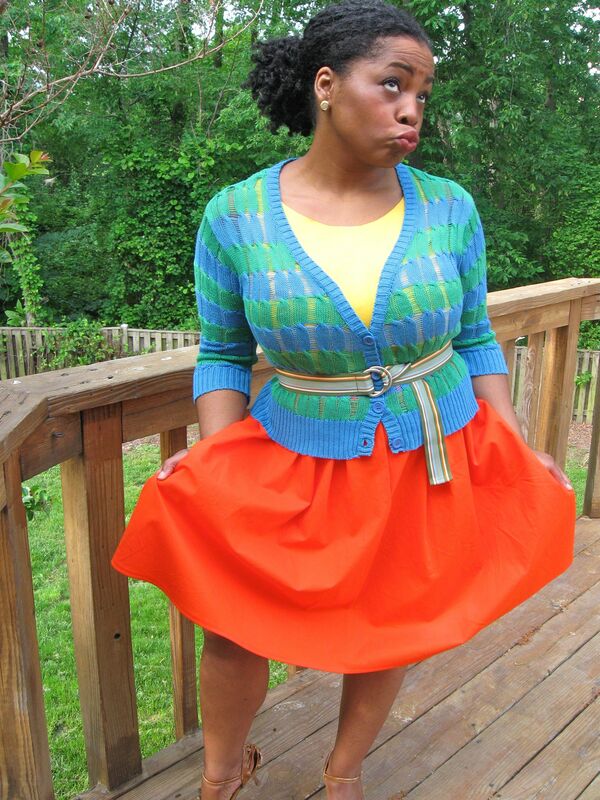 This entry was posted in Challenges and tagged DIY style, me-made may, najah-made, What I Wore. Bookmark the permalink. I love this combo! So uplifting. First of all, love your hair! This outfit is so springy! Love the bright colors. I cannot wait until I get as advanced with my sewing so I can make outfits weekly. What a playful outfit. Hate that I only have a coffee table. Can’t wait til classes start up again.